Will we know any more when tomorrow’s debate is over? That depends on whether we watch the debate or let someone else explain it to us. Journalists and bloggers of all political persuasions are so polarized at this point that their "facts" are almost buried in baseless opinions. The American political process is moving into full scale Halloween mode. Skeletons are dragged out of closets and tens of thousands of dead people are registered to vote. The candidates are so consistently viewed as caricatures that their basic humanity is lost to view. Opponents are demonized and the worst side of human emotion is put on view. With the Internet at your fingertips and channels like PBS and C-Span, that doesn’t have to happen. If you are interested in getting information from the candidates themselves, tune in tomorrow to the General Election Presidential Debate. My personal opinion is that C-Span coverage gives you more candidate time and less commentator snarkiness. Format: 90-minute debate with candidates seated at table with moderator. Candidates questioned in turn with two-minute responses, followed by five minutes of open discussion for each question. 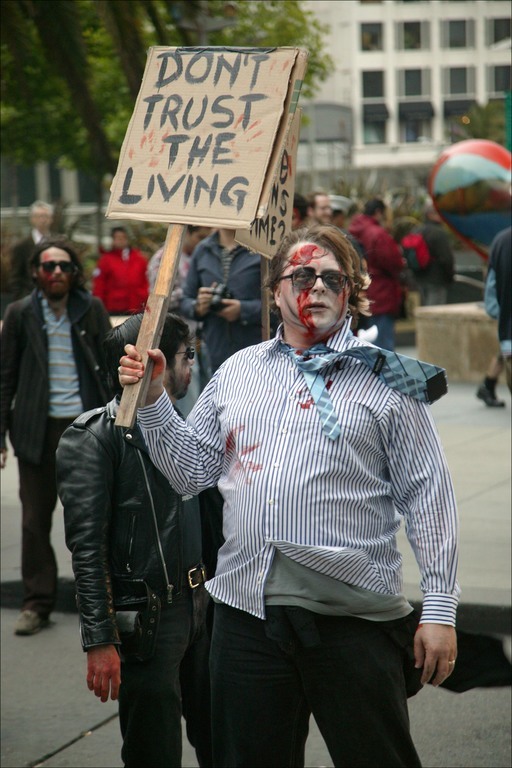 Click on "zombie voters" for more information on this international phenomenon. This entry was posted in 2008 Presidential Campaign and tagged Barack Obama, Bob Schieffer, dead people voting, John McCain, Presidential Debate, zombie voters. Bookmark the permalink. 0 Responses to Will we know any more when tomorrow’s debate is over? I’ve become a bit disillusioned with the US election. I’m not sure that either of them are very good. For example, I am suspicious of Obama’s overconfidence — how can he be so confident with so little experience? And I think McCain is pretty incoherent and seems to pull new policies out of a hat, suggesting that they’re not very well considered (i.e. the mortgage assistance program he mentioned in the last debate). I’m more impressed with Obama than McCain, but I find myself criticing Obama more than I do McCain just because so many things about Obama are brushed aside in the interest of unconditional praise: the distant terrorist association is significant, as is the fact that he attended a racist church for 20 years and only denounced it when convenient. And why can’t we see his birth certificate? It doesn’t really matter what’s on it, but why hide it? You may like Obama, but you can still recognize these to be problems. I don’t get this partisan stuff of not recognizing blemishes or taking any criticism of your chosen candidate as an insult to your entire existence. It’s as if, when you say something negative about the candidate, you’re assumed to be against the candidate as a whole. Getting involved in a discussion about it often becomes adversarial and useless, where everyone is looking for the rhetorical equivalent of wrestling’s eye gouge. As for McCain, I don’t think he knows what he’s doing. I don’t have confidence in him, even on the issues he’s supposed to be knowledgeable about. Another reason I’m suspicious of Obama is his 10-year energy independence plan. It’s the only thing he talks about that I know a lot about, and it’s impossible. It’s always good to aim high because you achieve higher even if you fall short of an extreme goal, but his calculations are completely wrong because the fuels he’s promoting aren’t the ones that are going to free us from foreign oil, and conservation isn’t prominent. So, if the course is wrong then I’m not going to be forgiving on the timeline. He is either lying or thoroughly incompetent with that point, and McCain is even worse because he’s even shorter on details. So, in our Canadian election, I can quite easily cast a vote. Our prime minister has a Masters in economics and is a policy wonk and his only serious competition has a Ph.D in sociology and is also a policy wonk. If I was voting in the US election, I wouldn’t feel comfortable with either of the major candidates. I’d either not vote at all, or vote on the fringes. If you need any video, everything is searchable as soon as the transcript/video data is available. On a final note, C-SPAN’s camera’s are already rolling, come check it out!